Monthly payments are made to pay off a mortgage loan. The amount goes towards paying the principal balance and interest, and is determined according to the down payment, term, interest rate and cost of the property. 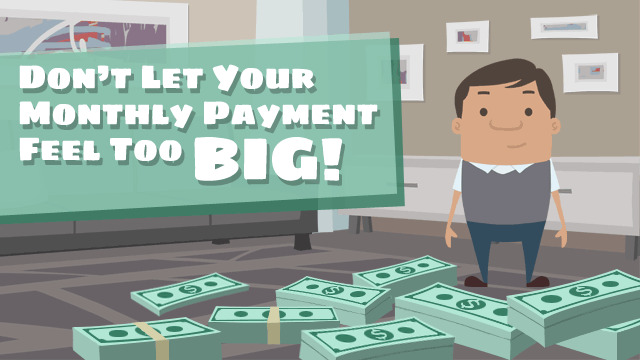 Your monthly payment is what you pay to the lender each month to repay your loan. The amount you pay every month depends on the terms of your mortgage loan. This includes the principal, which is the actual balance on the loan, and the interest on the loan. Because of this, the monthly payment is sometimes referred to as P&I. Your monthly payments differ depending on the term, down payment, price of your home, and the interest rate you have. If your loan has a fixed interest rate, the monthly payment amount does not change for the entire term of the mortgage. However, if you have an adjustable rate mortgage (ARM) the interest rate fluctuates. Since the interest portion may rise or fall, the monthly payment amount may change every few months. Many borrowers also choose to include funds for their escrow account in the monthly payment, so that the lender can pay annual property taxes and insurance premiums. Monthly payments are made on all kinds of loans, including those that use home equity as collateral. On a home equity line of credit (HELOC), the monthly payment is calculated based on the balance due, and how much you’ve borrowed. Whereas the monthly payments for a home equity loan depend on the type of program and its terms.